There are a great variety of traditional seasonings and foods in the world. Most of them are fermented, dried, or salted for the purpose of long preservation. 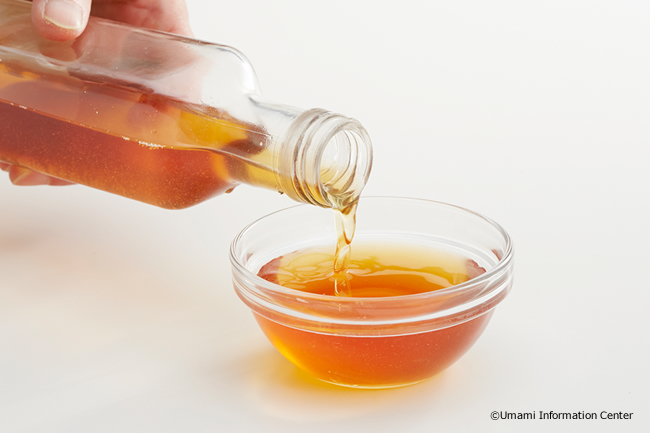 In this process, glutamate and other umami substances increase and add richness to the dish. 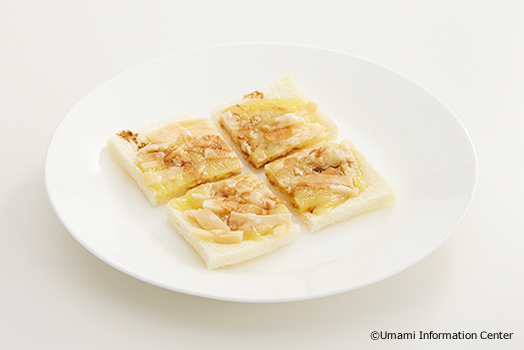 Here, we show some umami-rich ingredients that are cherished by local people. Different types of fermented seasoning can be found throughout the world. 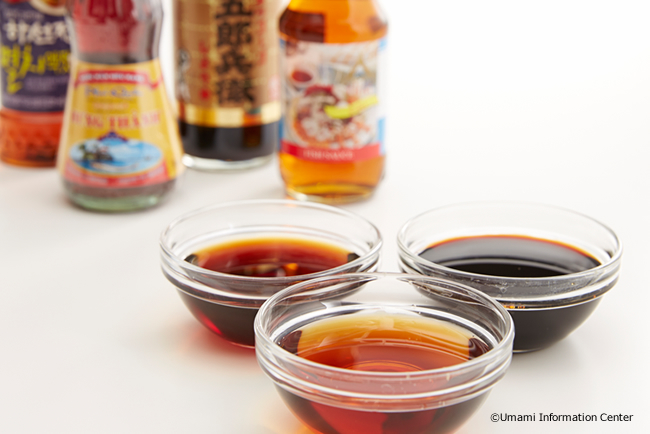 Fish sauces such as Num Pla in Thailand and Nuoc Mum in Vietnam, along with a range of fermented products typified by miso and soy sauce, have long been used and appreciated in Asian countries. Fermented condiments are made by adding salt to fish, beans, grains, etc., and allowing them to ferment. During the fermentation process, proteins are broken down into their constituent amino acids, and a condiment which contains high quantities of glutamate is produced. Particularly in Asian countries with a tradition of wet rice cultivation, daily cooking which does not include the addition of seasonings is unimaginable. This is a particular characteristic of countries where white rice, vegetables and fish form the staple diet. Rice based diets and simple forms of umami are very closely linked. Throughout the Ancient Roman Empire, fermented fish sauces called garum and liquamen were used as seasonings. These ingredients were equally as important as wine and olive oil. They were produced in the same way as the fermented condiments of South East Asia, with fish such as sardines and mackerels being salted and fermented. In particular, the amber-colored garum extracted first from the fermentation process was most highly prized. The famous ‘Apecius Cookbook’ of Ancient Rome contains many recipes where, in times when there was no sugar or salt, garum was frequently used. One could say that garum was prized as a condiment which combined umami and saltiness. The use of garum died out along with the Roman Empire, however anchovy paste and sauce can be seen as its modern counterpart. 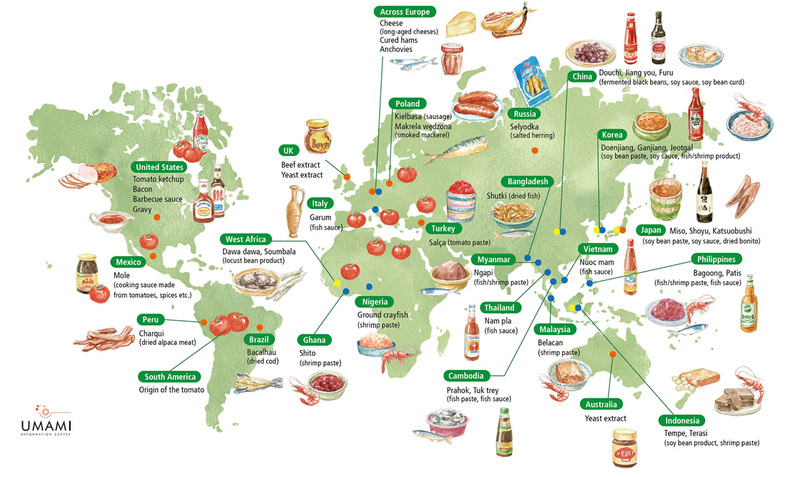 Tomatoes, which originated in South America, were brought to Europe when Columbus discovered the continent. It appears that they were originally used for medicinal purposes, but in Italy they underwent a re-evaluation, and were used as a foodstuff, forming the basis of a wide variety of dishes, and are now an indispensable ingredient of Italian cuisine. In the UK, Worcester Sauce was made from tomatoes and a wide variety of other vegetables, and this was eventually exported to America, along with tomato sauce and paste, where a variety of processed foods such as ketchup and chili sauce were produced. 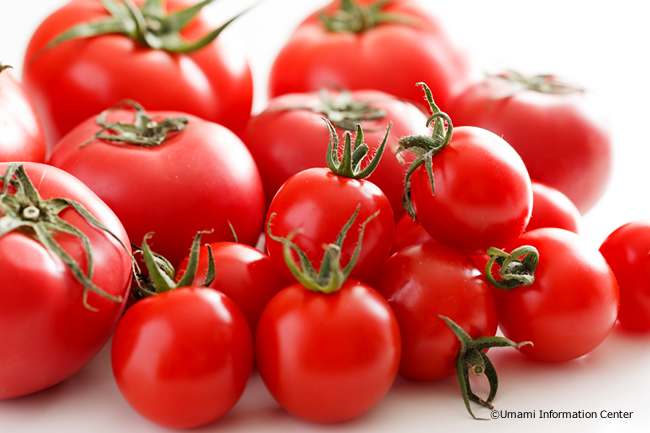 Today, tomatoes are one of the most widely produced vegetables on the planet and their umami taste is appreciated all over the world. This chart shows the levels of umami (free glutamatic acid) found in the Parmesan, Cheddar and Lea & Perrins sauce used in Claude’s “Cheese on Toast”, and the Marmite used in Sat’s “Sauteed pork with Marmite”. Parmesan cheese is one of the most umami-rich foods in the world, with 1680mg of free glutamate per 100g. For Cheddar cheese (matured for four months) the score was 78mg/100g, for Lea & Perrins 34mg/100g, whilst Marmite － a highly condensed condiment － recorded 1960mg for every 100g. The Lea & Perrin’s sauce used in Claude’s “Cheese on Toast” is a brand of Worcestershire sauce, a light, liquid sauce used for flavouring. The Lea & Perrins that Claude brought with him especially from the United Kingdom was a limited edition, extra-mature blend, but the regular version is found throughout British households, and is available in around 100 countries throughout the world (*1).Claude encouraged the students to try a little taste of the Lea & Perrins on its own, which the students described variously as “sour” and “spicy”. After splashing a few drops on top of the cheese on toast, however, students soon discovered that the cheese and Lea & Perrins sauce combined extremely well together, with each enhancing the umami of the other. Sat, on the other hand, made use of Marmite, a dark brown, sticky condiment made from yeast and vegetable extracts. It was first launched in the UK a century ago, and nowadays is often spread onto bread and crackers, as well as being used to enhance meat and fish dishes, as Sat showed in his recipe (*2).The Marmite was a perfect match for the rich, aromatic flavour of the sauteｴed pork, which certainly proved popular amongst the students. Sat then had each student try a small amount of the Marmite on its own － which they described as “intense” and “....wow”. “Marmite has a really unique taste,” Sat explained, “and British people tend to either love it or hate it, but we must remember that it’s primarily a condiment, so you can use it as part of a dish to bring out the umami already present in the other ingredients”. (*1)　Worcestershire sauce (Lea & Perrins) product homepage. (*2)　Marmite (Unilever UK Limited) product homepage. (*3)　Vacuum cooking:a technique whereby raw food is placed in a bag,either with or without seasonings / spices, and cooked at a low temperature in hot water,then served. (*4)　If using raw rib meat,season with salt and pepper,and saut well until fully cooked through.